Want to know one simple tip that can potentially increase your test scores by 10% in 10 minutes? Simple: follow the 10 for 10 solution! In a nutshell, create a cheat sheet before your PMP exam starts! What? You can cheat on the exam? When you arrive at the Prometrics centre, you have 15 minutes to learn how to use their computer software. This 15 minutes does not count towards your 4 hours of exam time. During this 15 minutes, you will go through a Prometrics tutorial, where you will learn how to go forward to the next question, go back to your previous question, mark a question for review, and submit your test. Now, unless you extremely non-tech savvy, you don’t need 15 minutes to learn how to do this. The computer system is pretty straight forward. If you use an exam simulator (like the ones we have at ExamsPM), you should already be prepared for the Prometrics test simulator. The software is quite similar. It would be more productive to use 5 minutes to go through the tutorial and 10 minutes to create a cheat sheet. Before you enter into the Prometrics exam room, you will be given 2 blank sheets of paper (legal size: 8.5 by 11). You can use the front and back of both sheets… so you sort of have 4 sheets of paper. You can use the space on these two sheets of paper to do calculations or write notes during your exam. Use the space on these 2 sheets of paper wisely because if you want more paper, you will have to give back the 2 original sheets. Since you’ve drawn out your cheat sheet and other notes on these 2 sheets, it doesn’t make sense to trade this in. 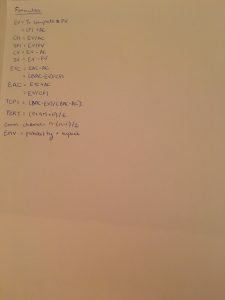 For all intensive purposes, assume you are only give 2 blank sheets of paper for the exam. When you are writing on these 2 sheets during your exam, be careful of your spacing and font sizes. Before your exam formally starts, use 10 minutes of your tutorial time and 1 sheet of paper to draw yourself a cheatsheet that you can refer back to during your exam. 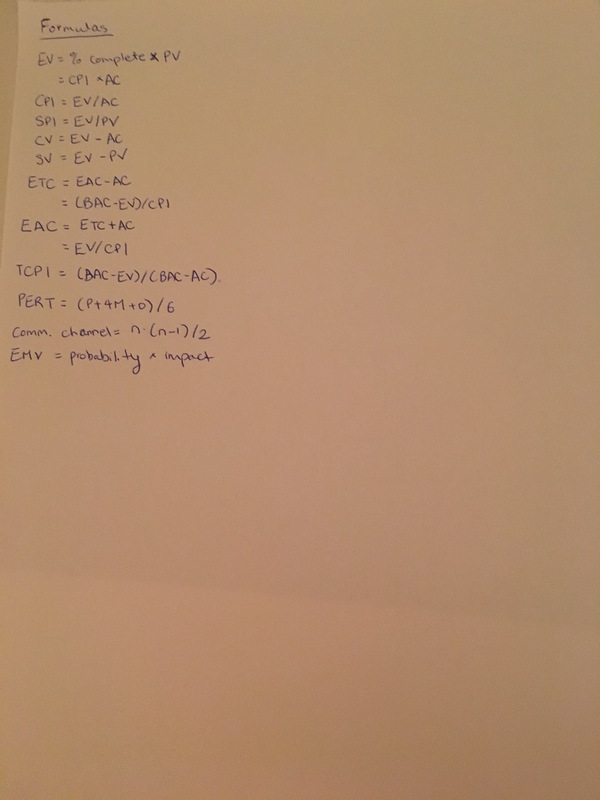 As you can see, my cheat sheet took 1 + 1/4 of a page. 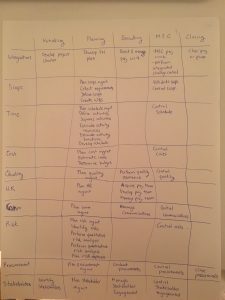 When you start out creating your cheat sheet, it’s a good idea to copy the process chart from your PMBOK guide the first few times because you won’t have everything memorized right away. It may also be a good idea to use the process chart as a photo for your screensaver or desktop display weeks before your exam so that it acts as a constant reminder of what you are trying to memorize. Why do you want a cheat sheet? You may be nervous for the big day because, after all, getting the PMP is a big deal. If you suddenly forgot something in the middle of your exam, you can cheat off of your cheat sheet. On your cheat sheet, you can write down everything you think you may need a quick reminder of during the exam. Since the PMP exam is based on the PMBOK guide, and the “skeleton” of the PMBOK guide is the process chart, having the complete process chart in front of you will be the best aid. Additionally, roughly 10% of your exam questions will be based on the processes, so having the process chart right in front of you is a constant reminder of which process happens before or after. Creating a cheat sheet is the simplest and fastest way to increase your test scores dramatically. Don’t let that initial 10 minutes go to waste. Write out everything you think you may need to know during your exam. Then, refer back to it during your exam whenever you need to. It is a good idea to draw out your cheat sheet once or twice day for a week leading up to your exam. When you are drawing the process chart for the first time, you will run out of space. Fitting 47 processes in a 10 by 5 chart takes some practice. It may take you several tries to figure out how big your font size and spacing can be. And let’s face it – we are all used to doing things on a computer nowadays. Drawings tables on paper may require special attention. Additionally, remembering all 10 knowledge areas, 5 process groups, and 47 processes take some time, so you should draw it once a day to solidify your memory. There’s also the need for speed. Remember: your goal is to be able to draw out your cheat sheet in 10 minutes or less. The benefit of drawing it out multiple times before your exam is so that you can automatically recall all the processes before your exam starts. If you get nervous, your unconscious mind will still be able to draw it out if you’ve drawn it enough times before your exam date. By following the 10 for 10 solution, you can see your test scores increase by 10% in 10 minutes. Can you really afford to not use this advantage? 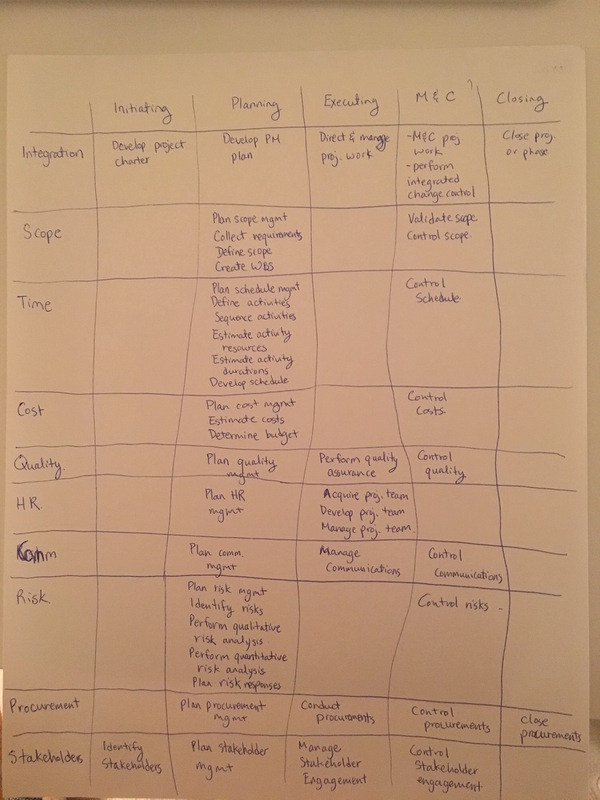 The 10 for 10 solution involves using your “grace period” of 10 minutes to draw yourself a cheat sheet that you can refer back to during your PMP exam. In the weeks leading up to your exam, you should practice drawing your cheat sheet once a day. Looking to Get PMP Certified? Previous Post How to Pass PMP Certification in 6 Weeks: A Step-by-Step Guide Next Post How Can the PMP Certification Benefit My Career?